Caryn Rivadeneira and Carla Barnhill are editors, writers, mothers, and wives. One is tall, one is short. One is thin, one is not so thin. One tends toward the conservative, one tends toward the liberal. One has two boys and a girl, the other two girls and a boy. But they are both passionate about motherhood and helping moms everywhere live the lives they long for, lives filled with joy and purpose and dreams. Caryn Rivadeneira has been a trusted voice to evangelical women since 1998, when she started editing Marriage Partnership magazine. 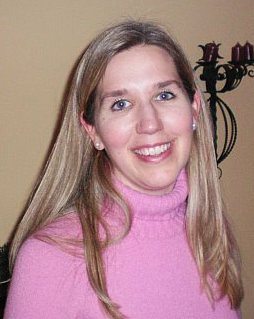 During her decade in Christian publishing, Caryn has spoken and written to women as managing editor of Marriage Partnership, managing editor of Christian Parenting Today, and as the first-ever managing editor of Women’s and Family Resources, a department she helped create at Christianity Today International (CTI). Today she touches the lives of women as an author—WaterBrook Press will release her fist book, Mama’s Got a Fake I.D. : How to Discover the Real You Under All That Mom, in March 2009—and in her work as managing editor of and regular contributor to CTI’s Gifted For Leadership blog, an online community for Christian women in leadership. Caryn lives in the western suburbs of Chicago with her wonderful husband, the three best kids ever created (no offense, but they really are! ), a relinquished Rottweiler, an abandoned bunny, and three feeder goldfish. Carla Barnhill has been in Christian publishing for 15 years. She is the former editor of Christian Parenting Today magazine. She also served as Associate Editor of Campus Life magazine. Carla now works as a freelance editor and writer, working for publishers such as Zondervan, WaterBrook, Baker, Tyndale, HarperOne, and Sparkhouse. She is the author of Blessings Every Day and The Myth of the Perfect Mother. Carla has also spoken to thousands of mothers at MOPS conventions, women’s retreats, and churches around the country. She is a sought-after source of new ideas about motherhood, parenting, and the spiritual formation of children. Carla lives in Minnesota with her wonderful husband, her dopey dog, and the three best kids ever created. This is an amazing website and two amazing women are writing it! I wish (as I am a grandmother now), that I would have been able to read your column in my parenting days. I would have felt intensely supported. I actually got tears in my eyes while reading! I was definitely a “freak” nursing my babies until they were two…carrying them around in a sling, and finally creating my own baby carrier because there was only one other one on the market…and it was terribly inconvenient. Now my job is to be the best grandmother I can possibly be…respectful of my children’s parenting ideas, unconditionally love, love, love those grandbabies, and be creative and nurturing with the babies whether they live close to me in St. Paul, live in Texas, or in Ammon, Jordan! I can’t wait to read more articles ladies! Keep up the superb work! Wow! Hey Carla…I just thought I would let you know that I am doing my part to get your book in circulation! I have been e-mailing all of my mom friends to tell them about the book, because it was such a glorious revelation to find it at a time when I was really starting to want more than just stay at home with my child. If it is not in circulation at the moment how can I let them know how to get it? I am living in the Dominican Republic, where my husband is from, for a couple of years where my husband took a job. I am just starting to find some ministry options outside of our middle class neighborhood serving the poor. Thank you for helping me see that doing something outside the house will help me be a better mom when I am home is not something I should feel guilty about. I found this blog through a friend who found out about it on beliefnet. I love the conversation you and Caryn have started. Keep it coming! Cool website. Thanks for telling me about it Carla. I am in a different stage of being a mom. My kids are at school all day and the oldest will be a senior in the fall. I am a mentor mom at MOPS and find that the best way to remember what it was like to have little ones is to see pictures, read my journals from 1992-2000, and hang out with moms who have young kids. I believe Caryn probably knows my husband’s cousin, Dawn, as she also worked for MP and now for Leadership. Such a small world. I live in Wheaton, and am an ’02 grad in Sociology/Theatre. I’d love to know where you two went to school – hoping maybe you are fellow Wheaties? Just discovered your blog and love where you stand. I love your website! I accidently stumbled upon it and have been laughing my head off just reading a few of your posts. Of course, I immediately had to go and find out who you are, and in the process bookmark you for daily reference. I’m heading to the bookstore tomorrow in search for your books. Oh… and yeah, I beg to differ, but I have the two best kids ever created.